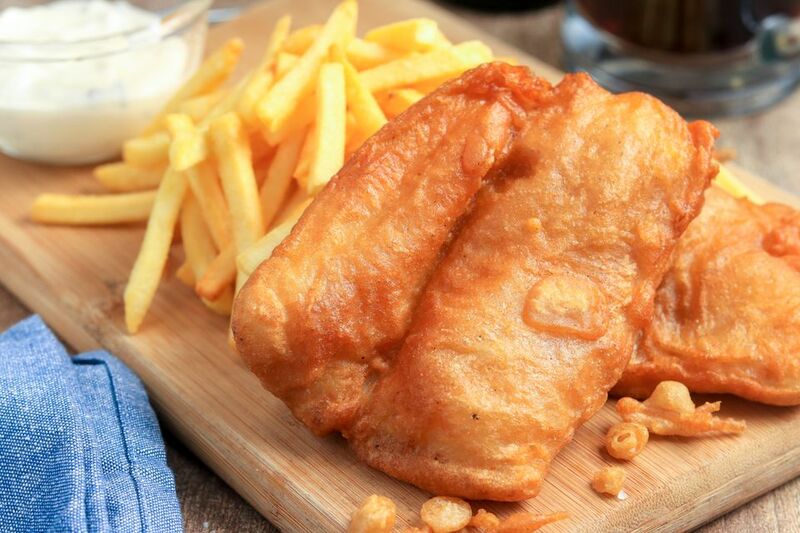 Classic Fish and Chips are a British institution, and they are one of the national dishes that everyone can't help but love. You can buy them from one of the thousands of fish and chip shops all over the country - including the world famous Harry Ramsdens, or you can make them at home. In a large roomy bowl mix the all but two tablespoons of the flour with the 2 ounces of cornstarch and 1 teaspoon baking powder. Season lightly with a tiny pinch of salt and pepper. Using a fork, and whisking continuously, add the beer and the water to the flour mixture and continue mixing until you have a thick, smooth batter. Place the batter in the fridge to rest for between 30 minutes and an hour. Cut the potatoes into 1-centimeter slices, then slice these into 1-centimeter-wide chips. Place the chips into a colander and rinse under cold running water. Place the washed chips into a pan of cold water, bring to a gentle boil and simmer for 3 to 4 minutes. Drain carefully through a colander then dry with kitchen paper. Keep in the fridge covered with kitchen paper until needed. Meanwhile, lay the fish fillets on a sheet of kitchen paper and pat dry. Season very lightly with a little sea salt. Heat the oil to 250 F in a deep-fat fryer or large, deep saucepan. Blanch the chips a few handfuls at a time in the fat for a couple of minutes. Do not brown them. Once the chips are slightly cooked remove them from the fat and drain. Keep to one side. Place the 2 tablespoons of flour reserved from the batter mix into a shallow bowl. Toss each fish fillet in the flour and shake off any excess. Then carefully lower each fillet into the hot oil. Fry for approximately 8 minutes, or until the batter is crisp and golden, turning the fillets from time to time with a large slotted spoon. Using the same slotted spoon once cooked, remove the fillets from the hot oil, drain on kitchen paper, cover with greaseproof paper and keep hot. Heat the oil to 400 F then cook the chips until golden and crisp about 5 minutes. Serve immediately with the hot fish accompanied by your favorite condiment. The debate always rages over what to serve. When making this classic version, make sure to use either Cod, Pollock, or Haddock for the fish. For the best fish and chips, choose the freshest fish you can find. Frozen is also fine, but make sure it is thoroughly defrosted and dried with paper towel first. Use a floury potato for the chips; the best varieties are King Edward, Maris Piper, Sante, and Yukon Gold.